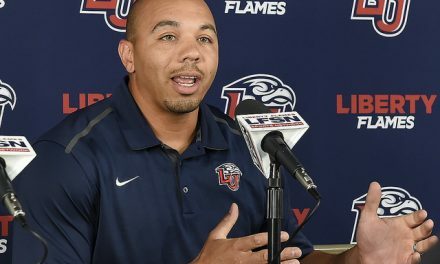 Update: The Flames picked up 3 additional JUCO commitments this past weekend, the final official visit opportunity Liberty’s coaching staff had before this week’s early signing period. Cheapell Jones-Morris, a 6’3″, 205 pound safety, committed to Liberty who was his only Division I offer. Jones-Morris played his JUCO ball at Sierra College in Rocklin, California where he recorded 72 tackles, 1.5 tackles for loss, 1 forced fumble, 1 interception, and 4 pass breakups. He attended high school at Foothill High in Sacramento, California. Defensive back BeJour Wilson also committed to Liberty while on a visit this past weekend. He’s a 6’0″, 170 pound prospect from City College of San Francisco where he is a teammate of fellow Liberty commit Kevin Shaa. Wilson played in 19 games the past 2 years at City College, and amassed 56 tackles, 6 tackles for loss, 2 forced fumbles, 1 fumble recovery, 20 pass breakups and 5 interceptions. He chose Liberty over offers from Alabama State and Southeastern Louisiana. Vincent Elefante is a 6’4″, 285 pound defensive lineman who also committed to the Flames this weekend. He attends Chaffey College in California after spending 2 seasons at FCS Sacramento State where he redshirted in 2015 and played in 3 games as a reserve in 2016. He also had offers from Idaho and Southeastern Louisiana. This past season at Chaffey, he recorded 26 tackles and 4 tackles for loss in 9 games. That brings Liberty to a total of 5 JUCO commitments, all of whom intend on enrolling for the spring semester. Those 5 go along with 17 high school prospects who have verballed to the Flames. Coach Gill hopes to bring in another 8-9 prospects, and we could see some of those slots carry over to the February signing period. Of the 17 high school prospects, JT Wood, Brendan Schlittler, and Michael Austin Lewis have stated publicly that they will be signing with Liberty Wednesday. Offensive lineman Isaiah Edwards, the 6’8″, 360 pound JUCO prospect out of Independence Community College, did not visit Liberty this past weekend as originally scheduled. Edwards visited Indiana State and ended up committing to the FCS Sycamores. Still no word on either quarterback Caleb Lynum or running back Elijah Davis and where they will end up. If you missed our football recruiting update late last week, get up to speed with the rest of Liberty’s 2018 class in advance of the beginning of the early signing period on Wednesday. Our previous football recruiting update from last week is below. Previously: Liberty is currently putting its finishing touches on the 2018 recruiting class, one that could be the most important in program history to this point. 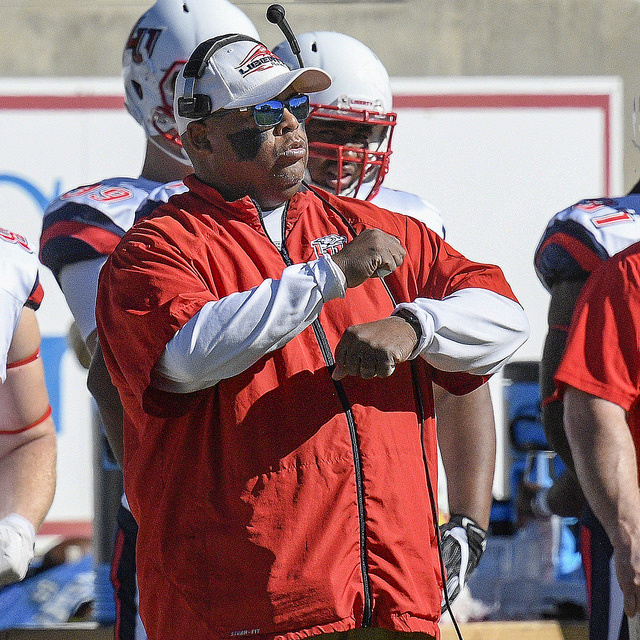 As the Flames are making the transition to FBS, Coach Gill and his staff are hopeful they are able to secure commitments from 5-6 junior college prospects in addition to a maximum of 25 high school prospects as part of this class. If the Flames are able to do so, they will be very close to the FBS limit of 85 scholarships for the 2018 season. For the first time ever, Division I programs can ink their prospects in December as part of an early signing period which is from December 20-22. Liberty has picked up commitments from two junior college prospects in wide receiver KEVIN SHAA and defensive lineman DEVIN PEARSON. Shaa is a 5’11”, 170 pound receiver from City College of San Francisco who also had an offer from Eastern Michigan. In his 2 seasons at City College, he appeared in 22 games while hauling in 42 receptions for 840 yards and 7 touchdowns. Pearson is a 6’2″, 318 pound prospect from Mt. San Jacinto College in San Jacinto, California. Liberty is his only reported FBS offer. 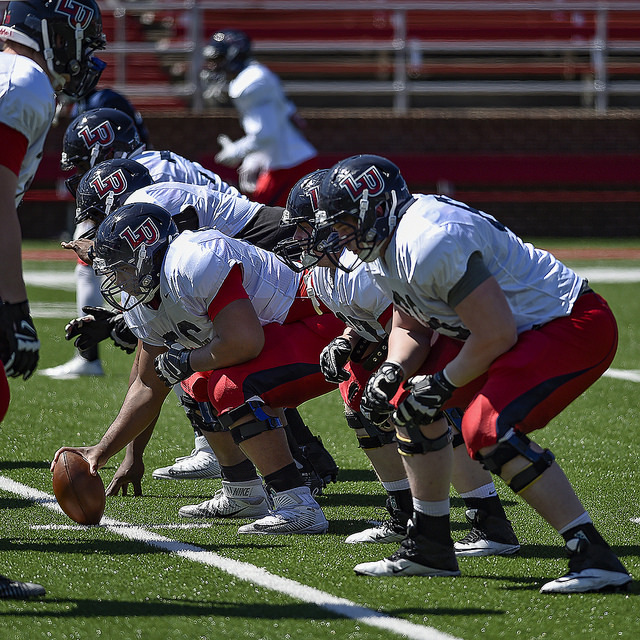 Offensive line has been one of the biggest areas of concentration for the Liberty staff, as the Flames currently have 5 offensive line commitments. 3-star prospect HENRY CHIBUEZE is the highest rated prospect of the group. The 6’2″, 330 pound prospect from Woodbridge, Virginia also had offers from East Carolina, James Madison, Temple, Virginia, and North Carolina. BRENDAN SCHLITTLER and DACODA WEAVER are also 3-star rated prospects. Schlittler is 6’5″, 300 pounds who was named 1st-team all-state following his senior season at Eureka Senior High School in Eureka, Missouri. He had 76 pancakes and allowed 0 sacks this season as he helped pave the way for Michigan commit, running back Hasson Haskins. Schlittler had numerous offers, including Army and Northern Illinois. Weaver is 6’5″ and 320 pounds hailing from Lakeland High School in Lakeland, Florida. He chose Liberty over offers from UMass, Bethune-Cookman, Central Arkansas, NC Central, and Towson. JACOB BODDEN and JONATHAN GRAHAM round out the offensive line commits. Bodden is a 2-star prospect from legendary Hoover High School in Hoover, Alabama. The 6’5″, 300 pounder touts Liberty as his only reported FBS offer, but he had numerous offers from FCS schools. Graham is 6’5″ and 300 pounds from La Plata High School in La Plata, Maryland. Liberty is his only reported FBS offer. SEAN QUEEN, the first commitment of this class, was 2-star wide receiver from Eagle’s Landing Christian School in McDonough, Georgia. The 5’11”, 180 pound prospect also had offers from Dartmouth, East Tennessee State, Jacksonville State, Kent State, Mercer, Presbyterian, and Southern Illinois. He helped his team win 3 straight state championships. Queen also won an individual state title in the long jump in 2017. Both of his parents also attended Liberty. JT WOOD and NOAH FRITH join Shaa and Queen to round out the 4 current wide receivers who have committed to Liberty. Wood is a 2 star rated prospect from Creekside High School in St. Johns, Florida. The 6’2″, 205 pound receiver chose Liberty over offers from Army, South Alabama, Troy, and Western Illinois. Frith exploded onto the scene as a senior, recording 80 catches for 1,412 yards, and 21 touchdowns. The 6’4″, 180 pound prospect was selected as the 2017 Region 4-7A Player of the Year in the ultra competitive district in Georgia. He’s from Woodstock, Georgia, where he attended Woodstock High School. 3 star running back, TROY HENDERSON, committed to Liberty over offers from Northwestern and Wake Forest. The 5’10”, 180 pound prospect is from Independence High School in Thompson’s Station, Tennessee. 6’4″, 235 pound MASON YOST is Liberty’s lone tight end commit. Yost is from the Bolles School in Jacksonville, Florida. He has offers from Coastal Carolina, Texas State, UNC Charlotte, Army, and several from FCS programs. In addition to the JUCO commit Pearson, the Flames’ coaching staff has secured commitments from 3 high school defensive line prospects. MICHAEL AUSTIN LEWIS is a 3-star prospect from David Crocket High School in Jonesborough, Tennessee. The 6’6″, 235 pound prospect had several FBS offers including Army, Colorado State, Kansas State, UMass, and Navy. LOGAN BEADLES and EMMANUEL CATER are 2-star prospects who have also committed to Liberty. Beadles is a 6’3″, 305 pound defensive tackle from Piedmont High School in Piedmont, Alabama. He chose Liberty over offers from Samford and Tennessee-Martin. Cater is a 6’2″, 260 pounder from Hiram High School in Hiram, Georgia. His only other reported offer is from Tennessee State. 4 year starter at Cherokee County High School in Centre, Alabama, TYREN DUPREE, is the only linebacker commit so far. The 6’1″ 200 pound prospect is rated as a 2 star and he has an offer from Central Arkansas. Dupree played quarterback and safety in high school. 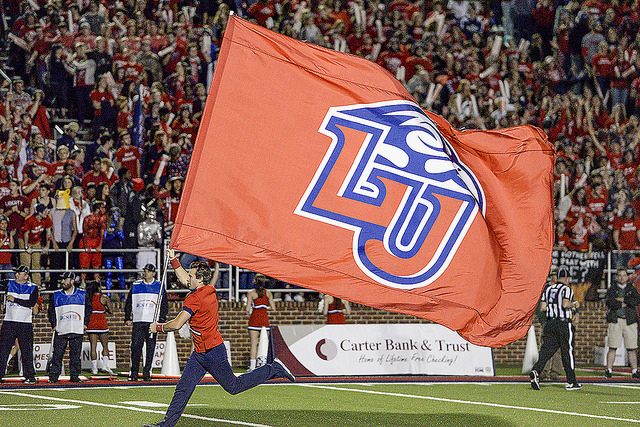 Three defensive back commitments round out the early pledges in Liberty’s class of 2018. HUNTER GOETZ is a 2-star prospect from Miami, Florida’s Miami Central High School. The 6’2″, 175 pound prospect had offers from Rutgers, Bethune-Cookman, Morgan State, and South Carolina State. He is the son of Chris Goetz who spent some time in the NFL with the San Diego Chargers and New York Jets. From the same high school in Charlotte that produced former Flame and current Miami Dolphin Walt Aikens, MARCELLOUS HARRIS, committed to Liberty early in the process. Harris is a 6’0″, 190 pound prospect from Harding University High School. He had numerous FCS offers to go along with offers from Army and Navy. Local product JAVON SCRUGGS helped lead Appomattox to 3 straight state championships. He will take his talents down 460 west to Lynchburg. At 6’0″ and 175 pounds, Scruggs will help Liberty’s defensive backfield. He played quarterback and safety for the Raiders. With Uriah West decommitting earlier this week, Liberty quickly jumped to offer running back Elijah Davis from local Heritage High School, and the Flames’ coaching staff has been putting the full court press on the Lynchburg native this week. Davis has offers from Old Dominion and James Madison. Stay tuned to ASeaofRed.com, your #1 source for Liberty Flames recruiting info. Be sure to save our football verbal commit page for the full run down of the commits. Also, give us a follow on twitter where many times recruiting news is first broken.